The Representative Office in Colombia manages business promotions and client relationships in Colombia. All transactions can be booked in our other branches, such as New York, Chicago, Los Angeles, etc. In 1979 the former Bank of Tokyo established the Bogota Representative Office. Due to security issues, the office was unstaffed between 1988 and 2010, when permanent staff was assigned there once again. 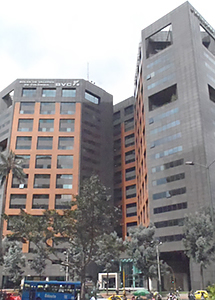 In March 2012, the Bogota Representative office was upgraded to a Sub-branch (under Japanese regulation). With stable growth and investor-friendly policies, Colombia is attracting increasing attention from the international business community. Since 2010 MUFG Bank, Ltd. has strengthened its presence by increasing the number of employees and by signing agreements with Bancolombia (the nation's largest private bank) and PROCOLOMBIA (the Colombian entity in charge of promoting tourism, investments and exports). Thanks to these actions and the dedication of our staff, we will continue to support business development for MUFG Bank, Ltd.'s customers and relations between Japan and Colombia.